Are the kids home from school this week on Christmas vacation? Here’s a yummy holiday treat you can make together. 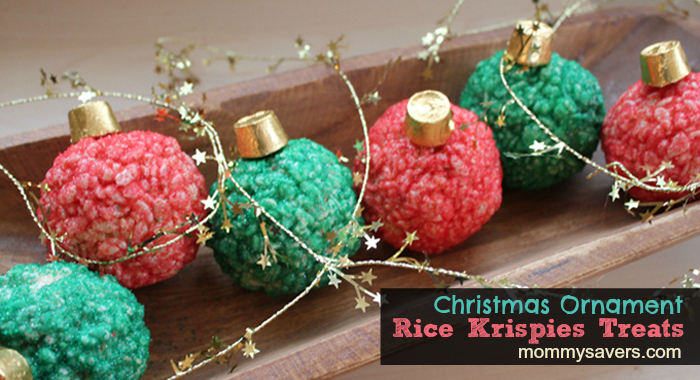 These Rice Krispy Treats Ornaments are a cute treat to bring to neighbors and they look great as a holiday centerpiece. Plus, with the high-value coupon out right now for Kellogg’s Rice Krispies, they’re even sweeter! Step ONE: Melt butter in a large saucepan. 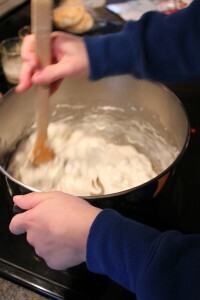 Add marshmallows and stir constantly until well-combined. Add vanilla, and stir again. Step TWO: Add the Rice Krispies cereal. Mix until all of the cereal is coated with the marshmallow mixture. Step THREE: Butter your hands well, then and shape the cereal into six balls. Make sure they’re packed tightly. 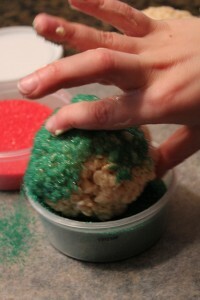 Acting quickly, roll the balls in colored sugar or holiday-colored jimmies or sprinkles until coated. Step FOUR: For the top of the ornament, stick a toothpick into one end of a Rolo candy. The other end of the toothpick long goes into the Rice Krispy ornament. these are very cute! I will be happy to never see a rice krispie treat for a long time though. I just made 100 candy cane shaped ones for my daughters school! These are SO cute!!! 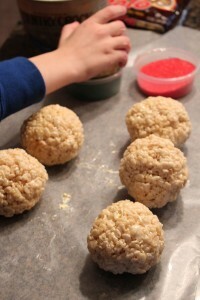 I want to make these with my kids tonight! 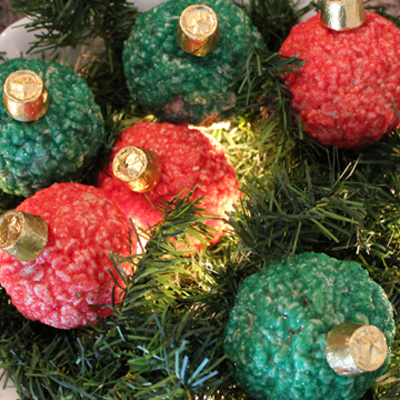 I think these will really liven up my cookie platters! I am excited to make them!! 😀 Thanks for sharing! I love love love these:) I haven’t experimented much with Rice Krispy treats, but can you add food coloring to the treats? Nevermind – I just noticed the 6 balls in the instructions. Can’t wait to do this tonight!! Just found this on Pinterest, loved the idea. I’ll pin it for the holidays! Instead of toothpicks try using a spot of royal icing to attach the rolos… wouldn’t want a lil person to get poked with a sharp toothpick! Can’t wait to make these! I have to make a lot though… about 30. I’ll just make them small. Also, I saw you can add food coloring to the butter mixture. I’d prefer doing that instead of rolling in sprinkles- trying to make it less messy! Would the food coloring give it a nice red and green color, just as well as the sprinkles? Also, I read that the balls form better when the mixture is set. Do you recommend putting the mixture in the fridge for a bit or something? No, don’t put the mixture in the fridge. It sets very quickly, so just allow it to cool slightly at room temperature before molding. Green works well, red food coloring will give it a pinkish color, so you won’t end up with very vibrant colors without the sprinkles. I am going to make these with my daycare children. They are adorable. How do you get the rolos gold? The holiday Rolos come in gold wrappers. How many does 1 batch make? These don’t have to be put in the microwave?? And is it all made in the saucepan on the stove?